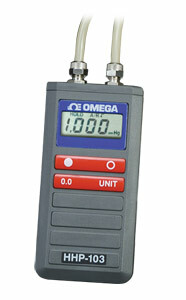 HHP-103 handheld air pressure manometers are designed for one handed industrial or laboratory use. The custom molded case allows this manometer to withstand continual heavy use and operation in industrial or humid environments. Each unit has a high contrast liquid crystal display with a backlight feature, which allows readings to be seen in all applications. The manometer can measure gage or vacuum pressures by venting the low and high ports to atmosphere, respectively , as well as differential pressure. Each unit has a low and high range, offering greater resolution and accuracy. Nota: Comes with 9 V battery and complete operator’s manual.